-Push the [START] push button until an engine start has been obtained. To enable this cycle, the alarm memory must be empty. The alarms are indicated by means of red LEDs. In order to clear the alarms, press the [STOP-OFF] push button. If a 'STOP cycle' is engaged, wait for the end of the ‘STOP’ timing, or push the [STOP-OFF] pushbutton again in order to reset the Stop cycle. The message ‘[Sta]’ is displayed in the 'Engine' menu during the Crank cycle. 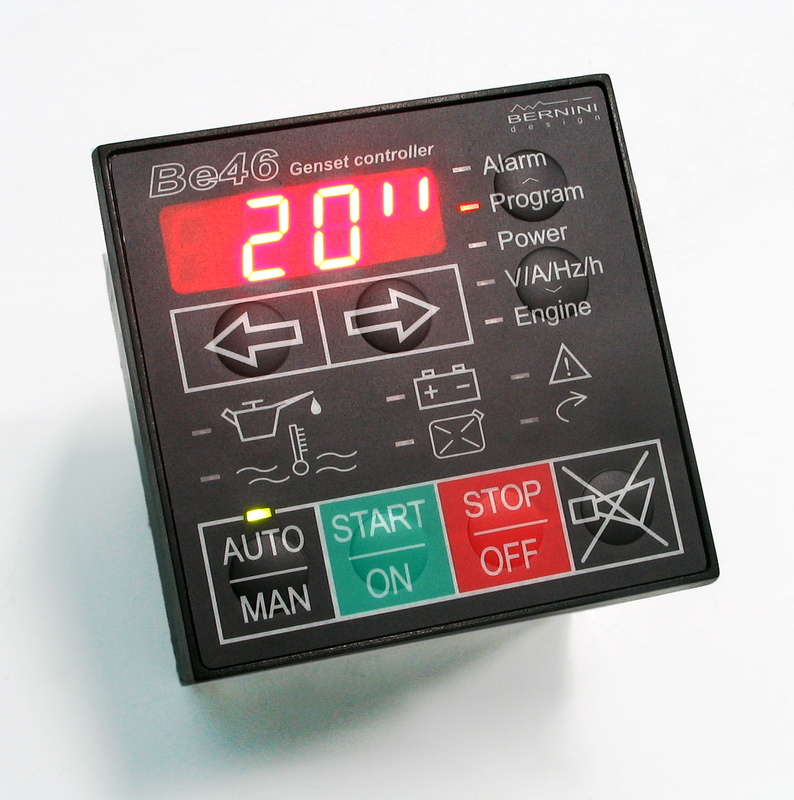 The Be23 automatically detects the moment to disconnect the 'STARTER' . The yellow LED ‘Engine’ flashes if one source of ‘Engine running’ signal is true. Further action on the [START-ON] push button will be ignored. If the 'PREHEAT' function is programmed, the ‘[HEAt]’ message appears on the display during the PREHEAT cycle. The fuel solenoid is automatically disabled if the engine does not start properly within 20 seconds (e.g. the user has pushed the [START] pushbutton too quickly). In 'MANUAL' operating mode all alarms are monitored except 'UNDER FREQUENCY' and 'UNDER VOLTAGE'. - Push the [STOP-OFF] push button until the message ‘[StOP]’ appears on the ‘Engine’ menu display. The FUEL SOLENOID (output #25) is disabled, and, at the same time, the 'STOP SOLENOID' (output #31) energizes for the programmed time. After the end of the 'STOP' cycle, pushing the [STOP-OFF] pushbutton will turn the Be23 to 'OFF' operating mode. The ‘OFF’ mode is a low power condition indicated by means of a decimal point on the right side of the display. -In Manual-mode the electrical load is normally transferred to the Mains independently of the status of the Mains. If the contactors are not used (e.g. not 'stand by' wiring) the user can connect the electrical Load to the Generator by means of a manually controlled circuit breaker. In this case, the 'UNDER FREQUENCY' and 'UNDER VOLTAGE' protections are not operative (enabled only in 'AUTO'). For this reason,it is better to use the ‘AUTO’ operating mode. In this way, an external contactor protects the Load and the Generating-set in all conditions (output #28).